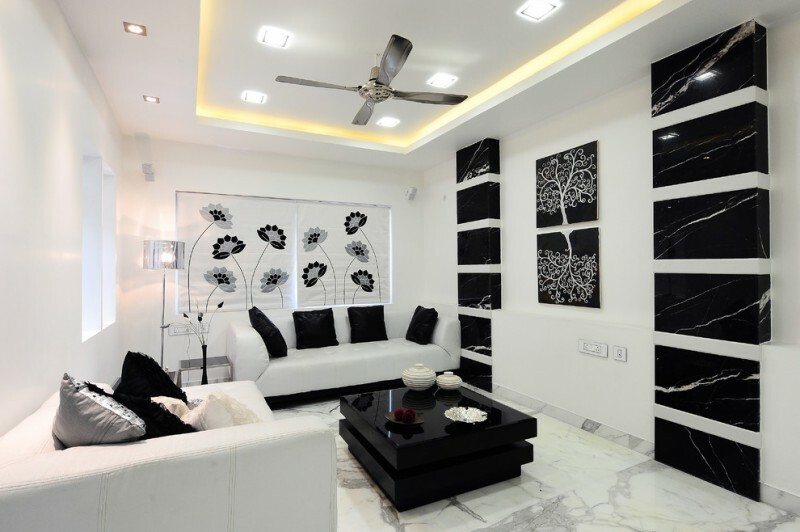 Black and white living room sets become one of favorite choices for furnishing a modern or contemporary living room. Why? They are simple yet modern. The colors are applicable for any color combinations. Well, to see more ideas of black & white living room sets, the following are the best references of black & white living room sets that may attract you or be a great idea to furnish your living room. Black leather sofa is always stunning. It seems so expensive and elegant, matching for a modern living room that needs simplicity in look and performance. A pair of white chairs adds the modern value as well as a function as the extra seats. Add more coziness with fluffy grey area rug that really fits the floors and furniture set. 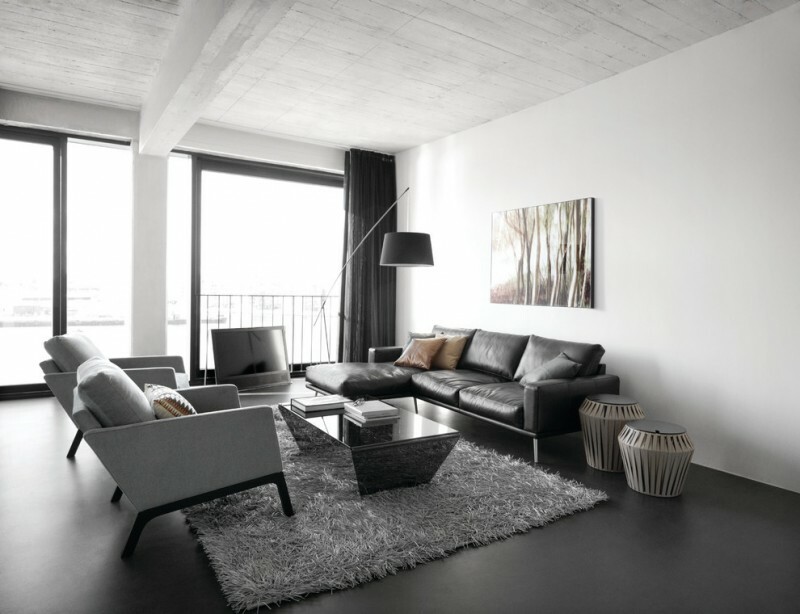 With grey and cream walls as the background, this black and white sofa looks so elegant and simply contrasting. The placement of furniture keeps making this room much larger, and the color choices also makes this room airy. This is an inspiration for a shabby chic living room with white walls and glass windows. This room is furnished with white chair slipcovers and black-painted center table. 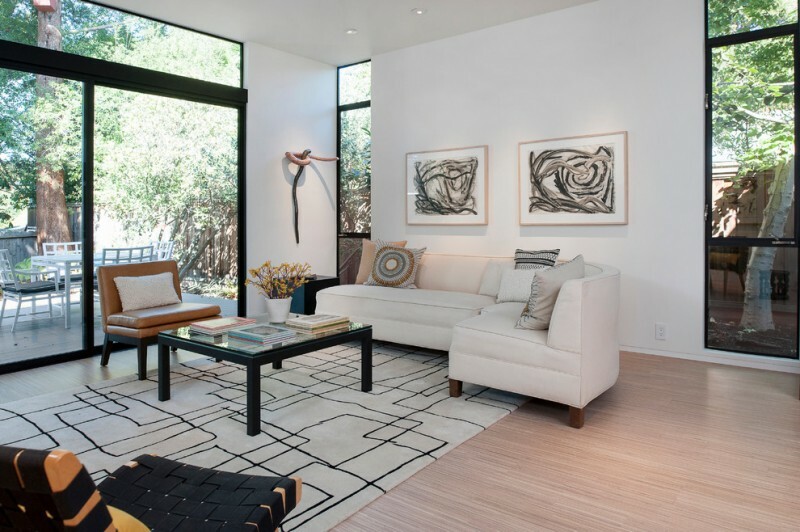 The stripped accent pillows and rug expand this living room. A couple of side table with their table lamps gives special attractiveness to the room. 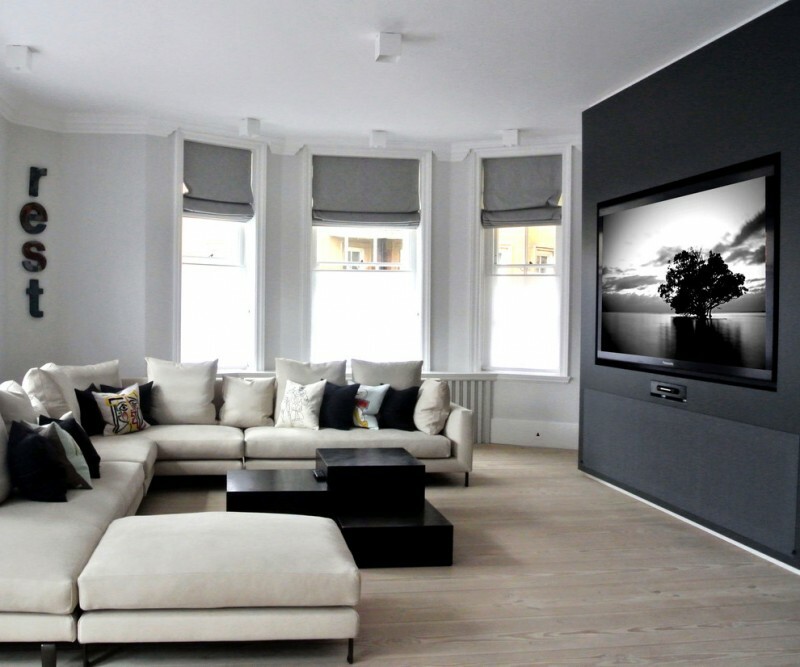 Black and white living room set idea for a contemporary living room. It’s simple but elegant. The furniture set is designed for functional and style purposes. A white coffee table is unique with thin stainless steel base and asymmetrical top, giving another direct interest after an oversized built-in media wall and ribbon fireplace. An enclosed living room with black and white furniture set plus multicolored supporting items. 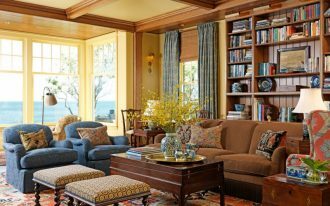 It may be said that these series of multicolored accent pillows and patterned rug is intentionally involved to create an accent color scheme without missing the elegance of furniture itself. 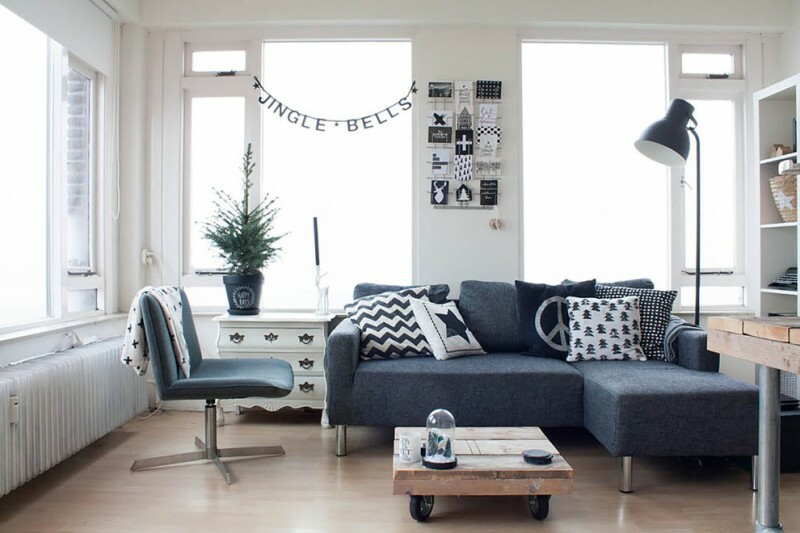 This idea may be applied for you guys who love more white and black than other color schemes. Black leather obviously contrasts with natural wood and soft white schemes, and the black love seat is adorable, its vintage design is Victorian one and the coffee table is more modern with its clear glass top. The rug, additionally, is much more precious as it is made by Indian’s hands. A clever idea of using red against dominant black and white in this living room. 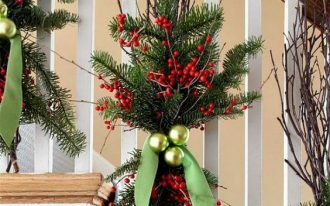 Yes, the books are just the accessories, but their existence importantly gives attractive scheme, specifically for the center area where we’re finding another ornament (vivid decorative plants on clear vase). 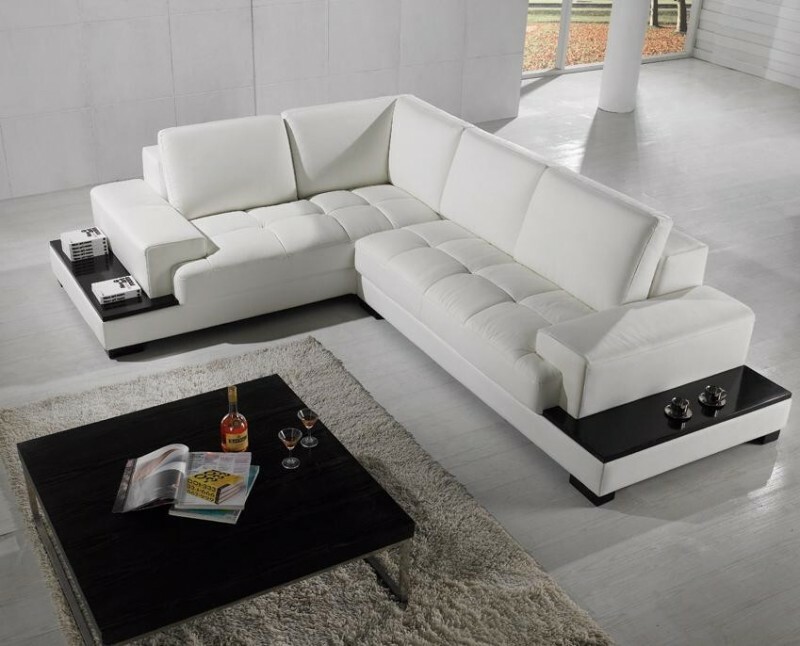 An ultra modern style sectional in white covered with extra comfortable leather upholstery from Italy. 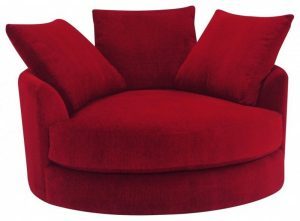 Actually, this chaise consists of three different pieces: two chaise lounges for left and right and sofa in the middle. This seat has white finishing accented with black. It’s striking with bold background wall, glossy black floors, and lighter-toned area rug. What such a perfect combination. Isn’t it? Another ultra modern sectional option dominated by white and black accents. The sectional is supported with two units of headrests, facing chaise on left, and built-in storage in armrest. 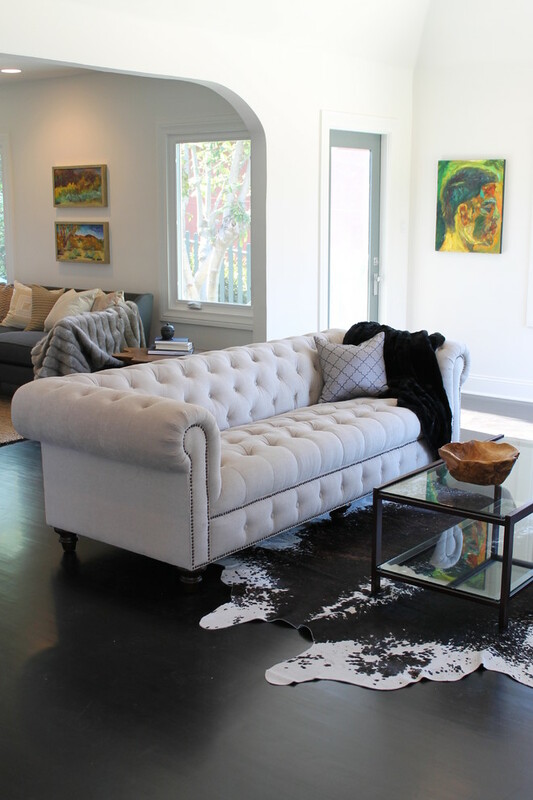 Best leather upholstery perfectly covers the whole parts of this sectional. 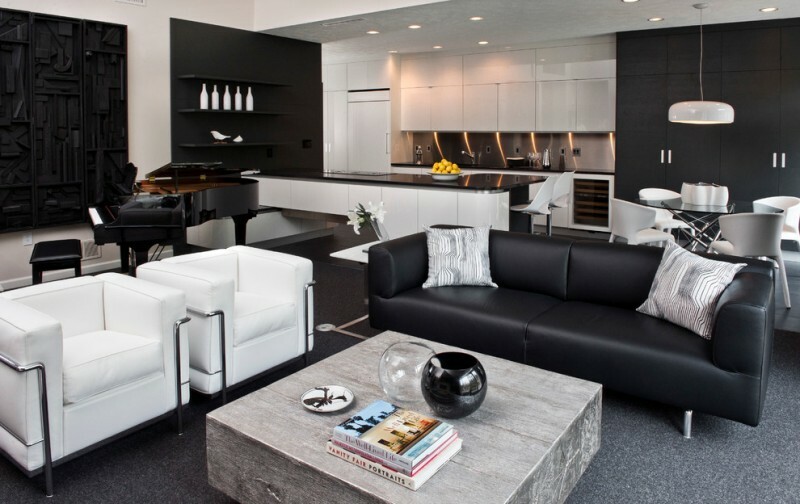 And, black glass top table with bonded white leather completes this sectional. What a perfect living room set it is. 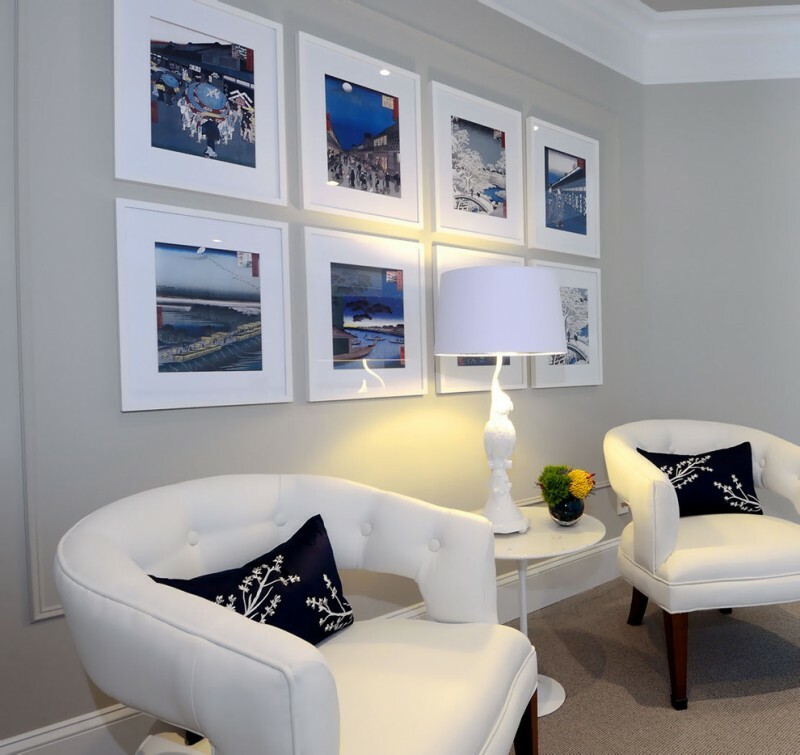 Soft white sofas comforted with the series of accent pillows surely provide much of comfort. Improve their performance with simply solid black coffee table with a small decorative vase. Add color accents by covering the floors with monochromatic rug. The lighting warms the space up by its glowing yellow lights. A dominant black sectional with little bit white accents. This seat is supported with a facing chaise and built-in storage in its armrest. With this additional feature, it’s the best alternative for an extra bed as well as a practical storage solution. 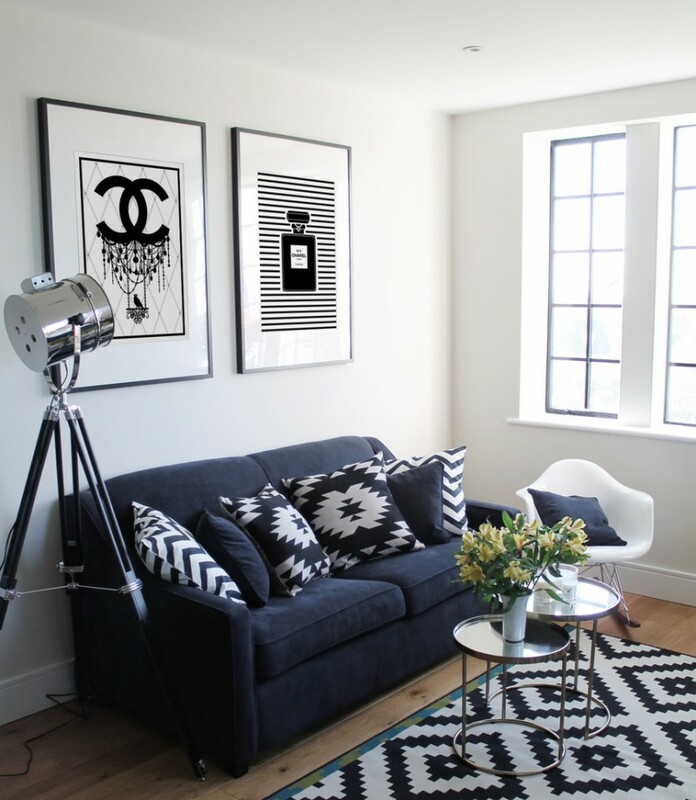 Garnish the bold black sofa with zigzag-patterned accent pillows. A love seat with similar basic color and color accents seems to be a perfect match for the sofa. Both provide comfy and stylish seat features for your guests. Complete them with clear glass top center table in oval shape. 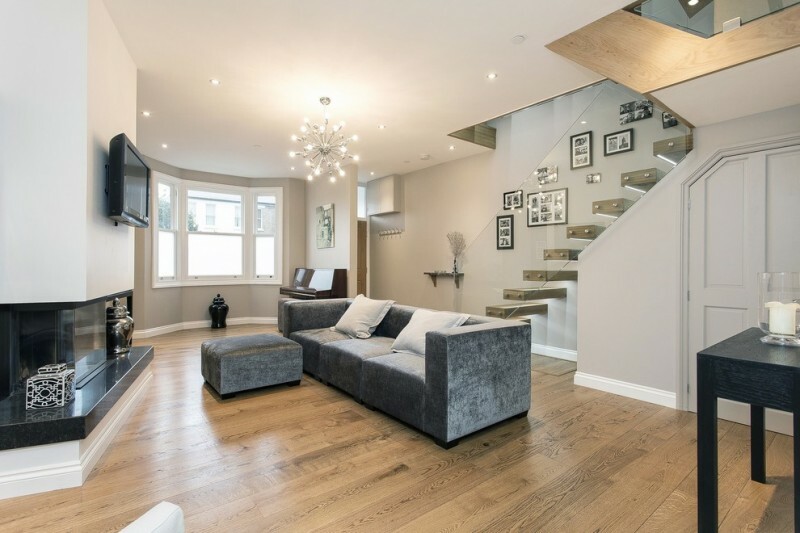 As the complementary piece, add a grey rug and make your home floors beautifully contrasting. It’s unique. 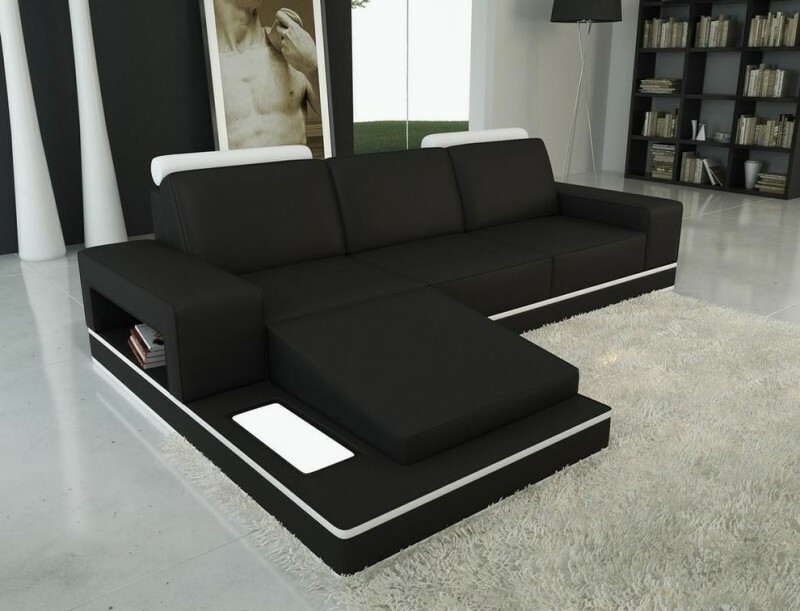 The concept is white and black sectional with adjustable headrest. Its color makes us don’t need to add any supporting items like accent pillows. The sectional is more than enough for highlighting this modern living room. It’s sweet to combine simple & modern sofa with solid black coffee table. A monochromatic chair without armrests becomes a special match for both, providing an extra seat for reading or just for welcoming the guests. 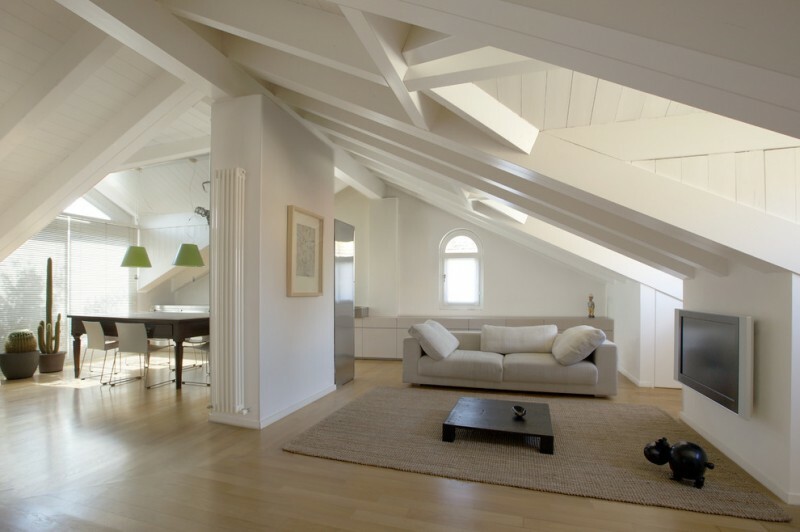 Pale-toned wood floors as if become a softening base, as good as the walls, which gently reduce the dominance of solid black. A modern chic living room idea with elegant black sofa and soft white chairs addition. The most interesting one is block butcher coffee table made of white oak. It gives natural element among the fabricated living room set products. Grey rug lets them stand out. Fill your small living room with such single black sofa accented with decorative pillows. 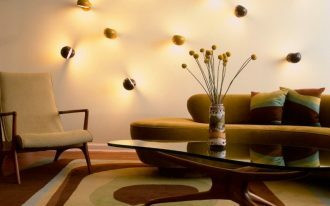 A floor lighting fixture looks so dominant here as it’s distinctively made of stainless steel, and layered round glass top table amazingly completes the seat. The rug, additionally, gives similar tone to the pillows, showing a harmonious match for both sofa and modern white rocking chair. 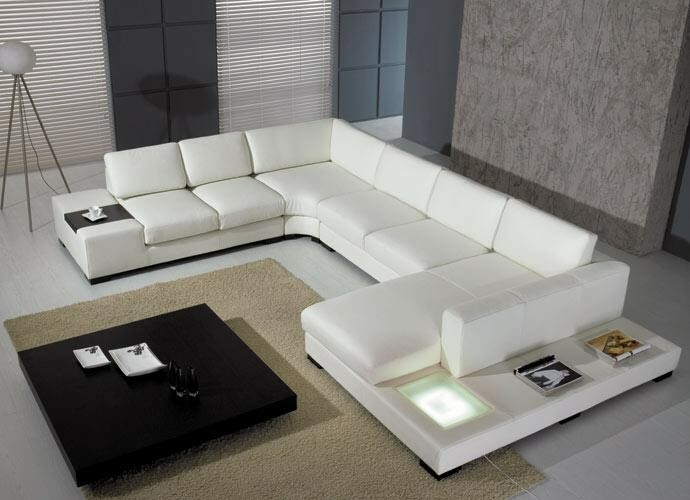 A contemporary sectional sofa in white covered with best quality leather. The sectional features a veneer coffee table and no headrest. The frame is made of plywood and hardwood. It also has been padded with polyester for the outside and sponge for the inside. To provide huge comfort, the sectional is supported with removable back cushions, but no accent pillows. A set of high end furniture for a modern living room. 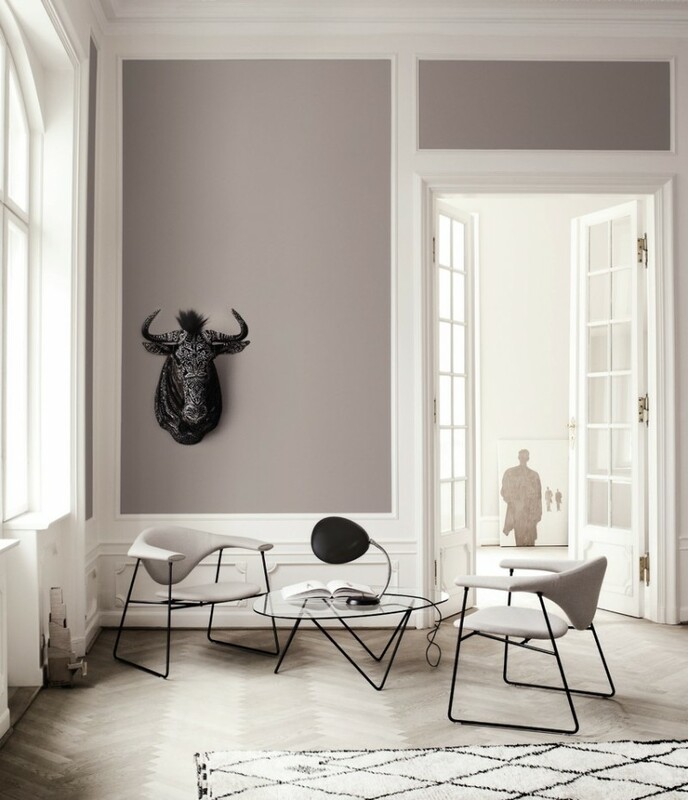 Black and white contrast the walls and baseboard, and an artistic wall decoration actually gives natural and ‘wild’ touch to this modern style room. What about the furniture? All furniture bases are lightweight metal and black is chosen to accent the white used for the seats and glass top table. It’s such a great living room set idea. With unique design, these two black chairs will surely give tons of comfort and style. A single sectional with facing chaise provides an extra seat which is also applicable for an additional mini bed. Its compact and clean lines concept meets the room’s style. Modernity isn’t the only goal; this idea also wants to expose more simplicity and functionality than details of furniture design. 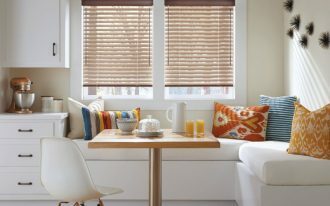 The furniture choice lets you have larger space with minimum ornaments; this is called a modern concept in home interior design. Black and white concept isn’t always about white or black dominating the space. 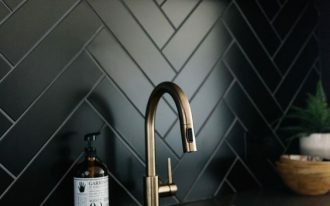 You can put black in less portions and apply it for just garnishing the room. The throw pillows, wiring system on pendant lamp, and area rug are just few items how little black keeps so stunning when it’s just used as the accent color. Purely and classy white side chairs complete your small living room. Dark throw pillows with white floral motifs additions, of course, give a direct attention as well as huge comfort for users. L-sectional in white looks so inviting with extra chaise and several throw pillows. The center table is designed in some layers and asymmetric, giving unique and creative piece for such contemporary living room. 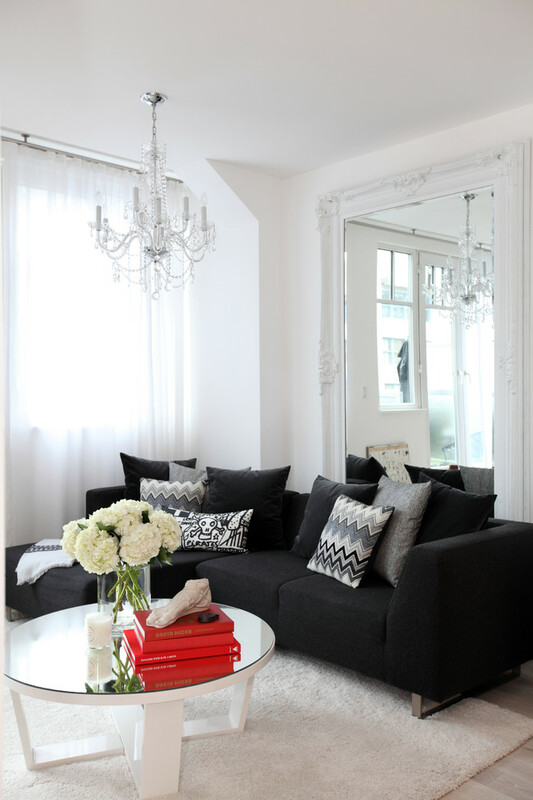 The black color, similar to few throw pillows, is intentionally set as the color accent. This modern living room highlights the furniture set and creative wall ornament layouts. Actually, the furniture isn’t special yet quite stunning on color. Black and white is chosen as the primary colors and they’re well-applied on the furniture itself. The walls display different art exhibitions where each wall ornament represents the natural elements within modernity. 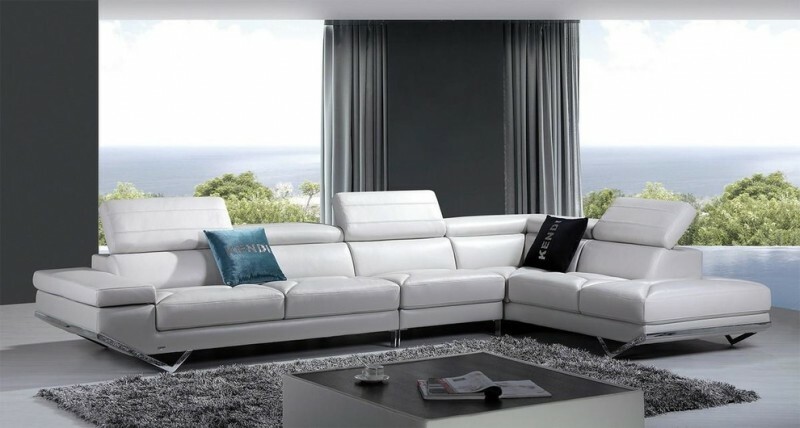 White sectional with best leather finishing. 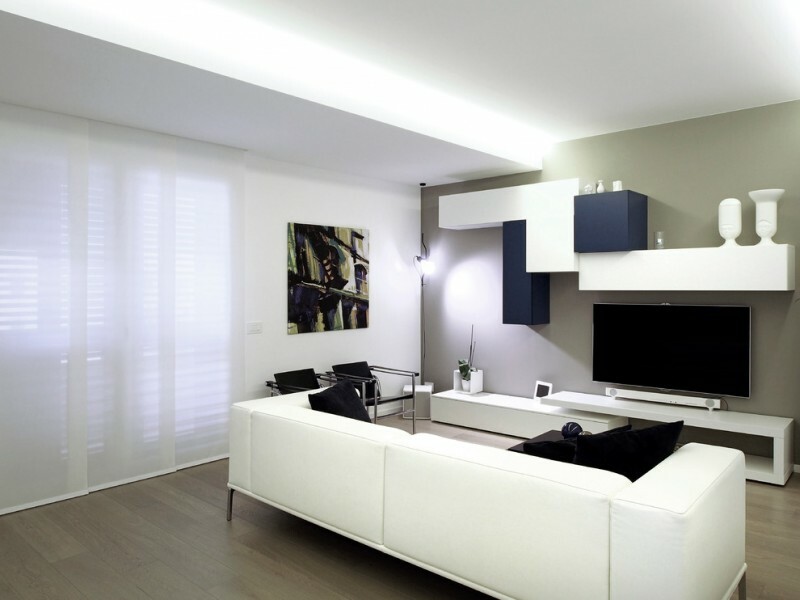 This is a good choice for a contemporary style living room that brings much simplicity. The sectional is equipped with a facing chaise and extended base block which is usable as an extra side table. Feature it with high end coffee table surfaced with dark glass top. Light grey modular sofa idea collaborated with black-white stripes rug and modern black side table. It must be interesting if you have such sofa product since it’s designed adjustable on back and arms-rest. 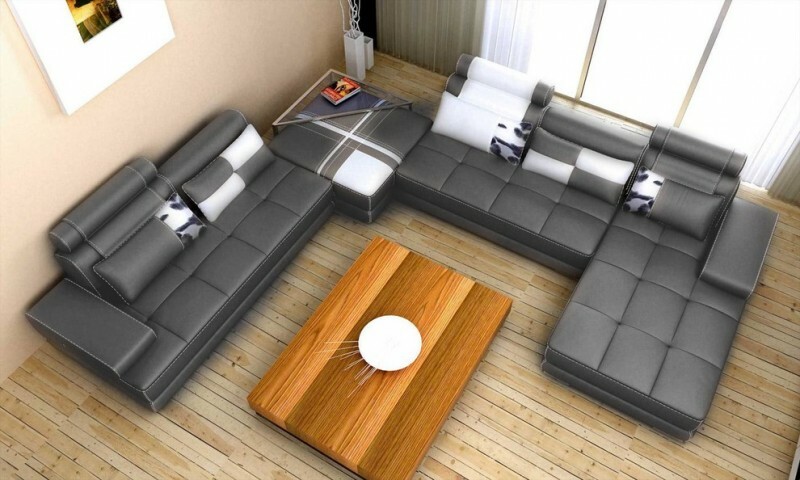 With this, it’s possible for you to have various of sofa arrangements as you want. Sound so interesting, right? Impress your guests just with such living room set. It’s totally true that white is always charming and elegant. It’s much brighter after being featured with something dark and bold like this solid black-framed standing mirror. Give more accents in this room such as simple black table lamp and rug with black-yellow accent colors. White sectional with white Italian leather and extra wide chaise pad. The pad is usable for putting your favorite books or even the drinks. Black finishing solid oak table becomes the best match of the seat. Cream area rug not only provides the aesthetic value, but it also offers the coziness and warmth for every step. 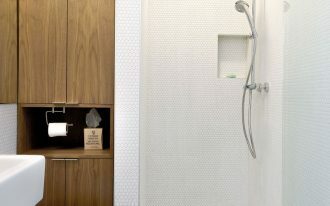 Limited space isn’t a serious matter if you remodel it correctly. Just put one or two units of seating feature and complete them with several supporting pieces like throw pillows, medium/ small sized rug, small side table, and small-dimension floor lamp. Give a special accent color to your modern white sofa. It could be solid black throw pillows that convincingly add attractiveness in your living room. Or, choose black leather back-rests to your industrial chairs. Black here surely will gives modernity as good as the chairs’ metal structures do. 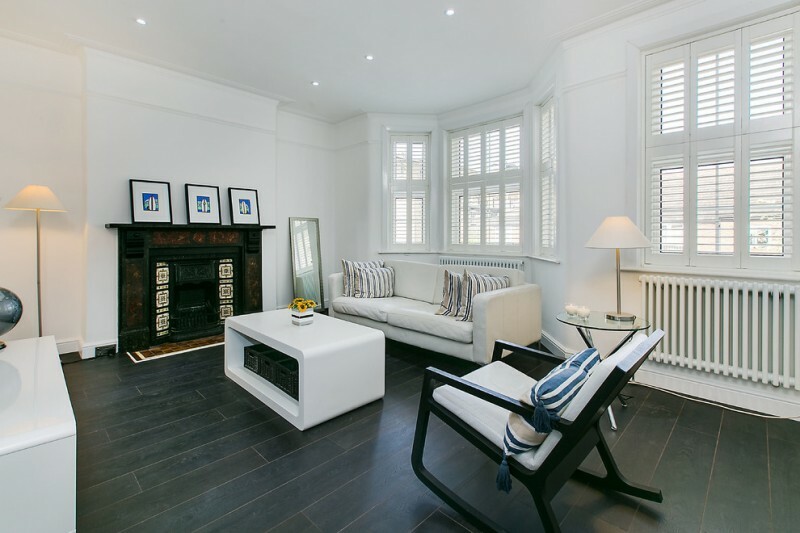 Soft and simple; a white sofa completed with a black-finished coffee table. They are best match for such a modern living room. The table is designed as a focal point of room, giving the most distinctive and attractive one in the middle of soft-toned space. And, take a look at the beams, they’re so fantastic. 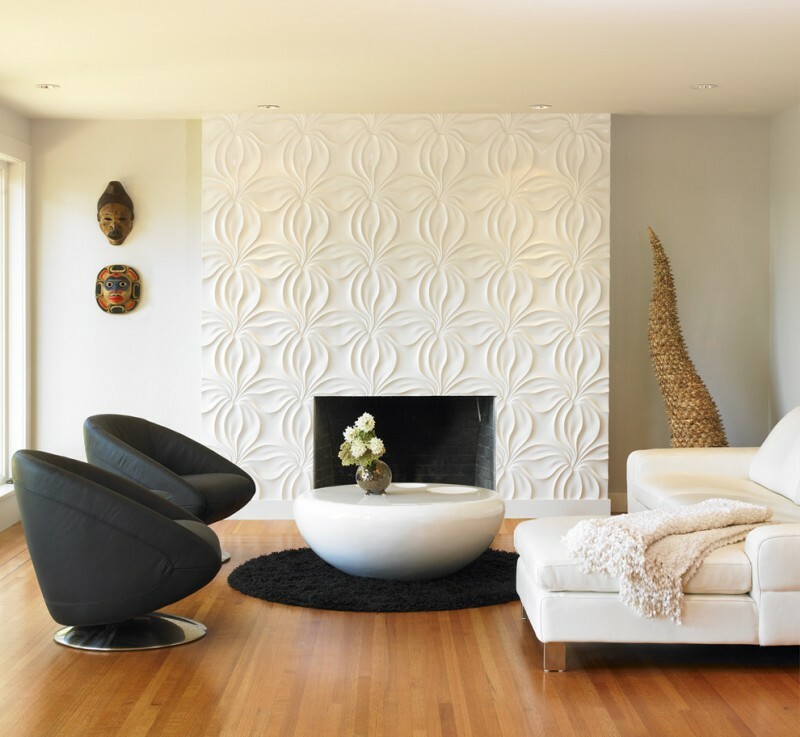 Discover another variant of black-white living room remodel just by making complementary pieces as the main focal point. These black throw pillows, for instance, have successfully enchanted us instantly. They obviously contrast to this white interior space. Modern white with adjustable headrests and stainless steel bases, a great choice for a contemporary living room. Add solid colored throw pillows as the accessories as well as the comfort makers. Dark glass top coffee table is the most recommended match for this unit of seating feature. It’s ok if you want to cover the floors with fluffy grey area rug. This, surely, will be a complete package for your cozy living room. 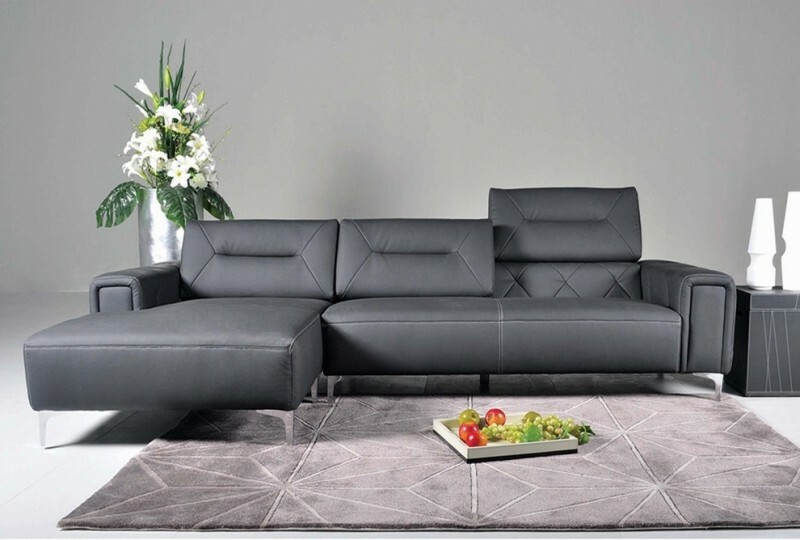 L-shaped leather sectional with additional facing chaise can also be the best choice for such modern living room. 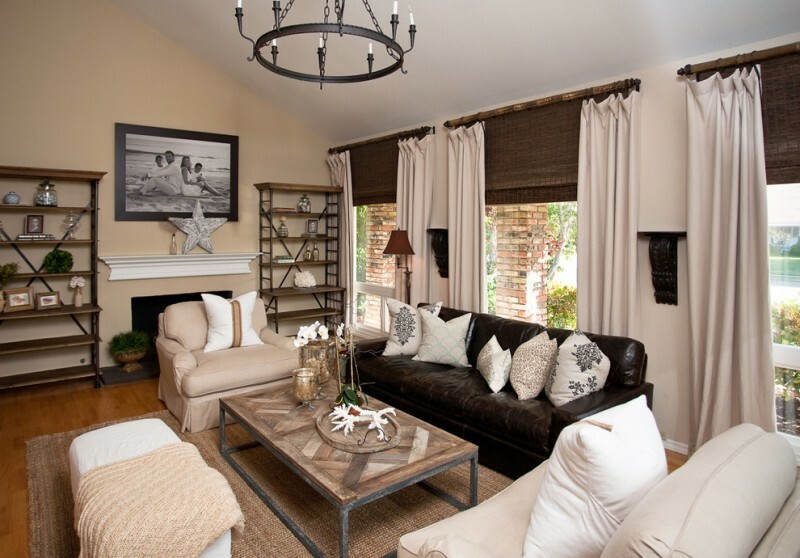 Cowhide and white accents are added for giving a chic & contemporary visualization. Wider padding here offers maximum comfort for sitting, and tufted seats give the style. And, an unfinished wood table gives natural element in the middle of modern concept living room. What a perfect combination! 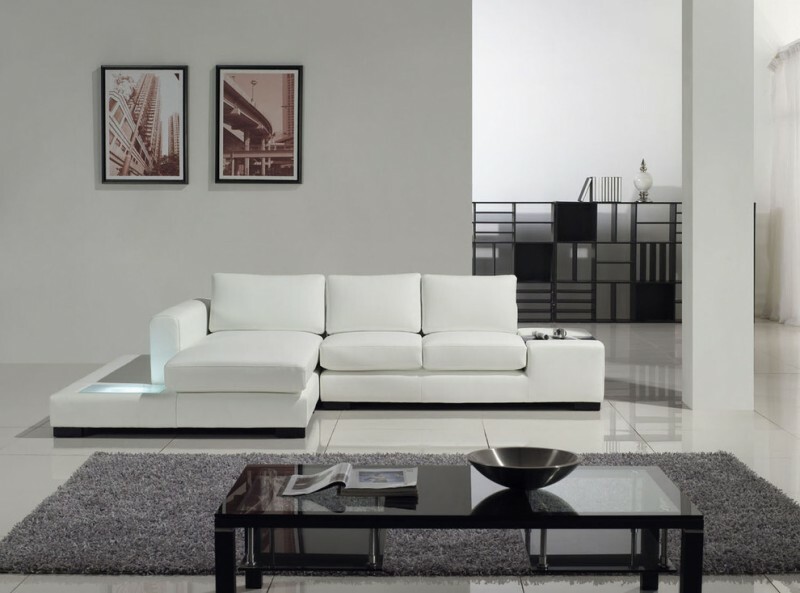 Furnish your modern living room with such cozy and clean lines sectional. The sectional is designed with black accent and headrest additions, providing extra comfort and style. It also has additional chaise in which its armrest is completed with a wider padding lighted up with inner decorative lighting fixture. To make this room balanced, add a solid black book rack plus a floor lamp as the beautiful contrasts. Make your living space simple yet modern with this elegant & solid black leather sectional. Like previous one, the sectional has been supported with white accent headrests and additional chaise with armrest. And interestingly the armrest is equipped with under shelf for books. A cozy living room includes a traditional fireplace accented by modern white plaster surrounding, modern white coffee table, white couch with stripped throw pillows, round glass top side table, and black wood-structured rocking chair with white back and seating features. 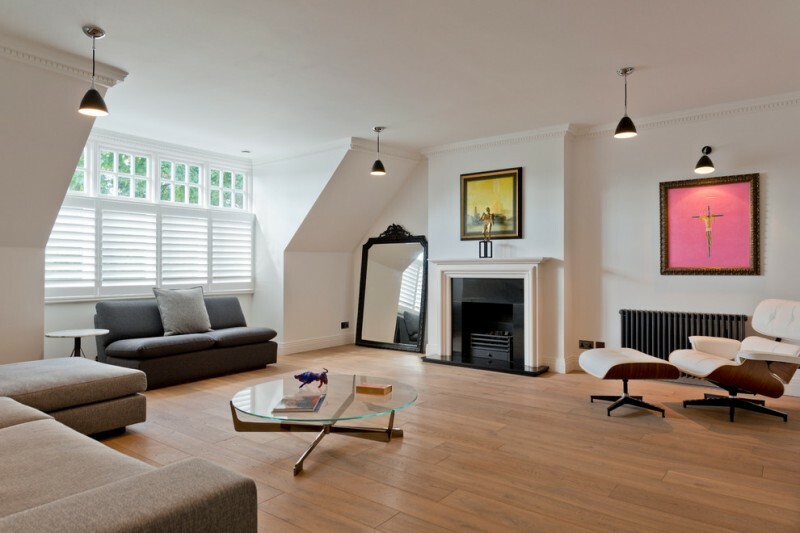 The room fills of balanced modern-traditional interior pieces. It’s, of course, unique and best concept to choose for you who love both styles. The room feels so airy and fresh due to the window application. The furniture choice also supports it. 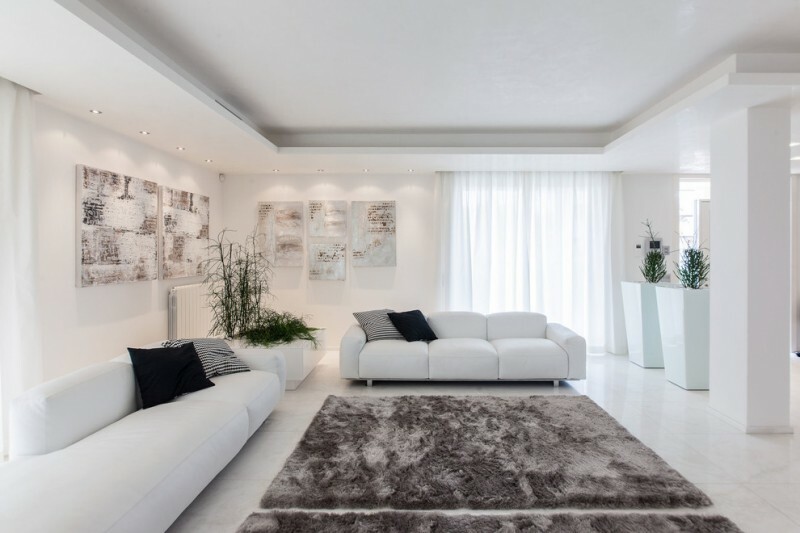 White is the best color choice to create an airy atmosphere. An industrial coffee table with wood surface gives natural element in this room, and fluffy black rug doesn’t merely offer the comfort, but it also exposes a modern style. 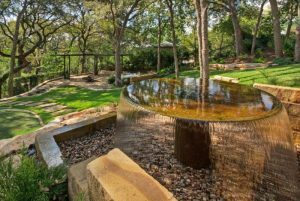 Want to make this your next project? Grey velvet couch with white throw pillows looks so stunning when it is paired with the similar-toned ottoman table. Black-finished side table, in the other side, becomes an accent for a modern look. The fireplace and TV application strengthen the modernity already applied in this room. This living room doesn’t fully show black and white concept, yet it keeps including black and white as individual color. They are applied individually on different furniture set. A set of modern reclining chair with table, for instance, uses white for covering its surface and wood color and black at its base. Black is obviously found at the armless couch which exposes more its smaller size. Premium dark leather sofa with bright-toned throw pillows must be a special attractiveness in this modern rustic living room. Wood elements here create natural warmth that gives extra cozy, yet black wrought iron application on some industrial furniture sets add old & antique look in room. And obviously, soft color tone discovered in some interior pieces supports in creating warming nuance. 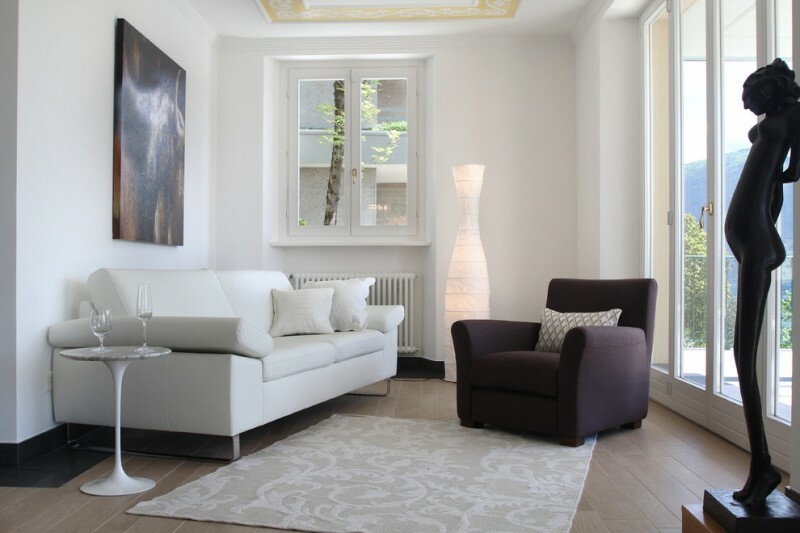 An inspiring minimalist living room furnished with minimalist living room set. 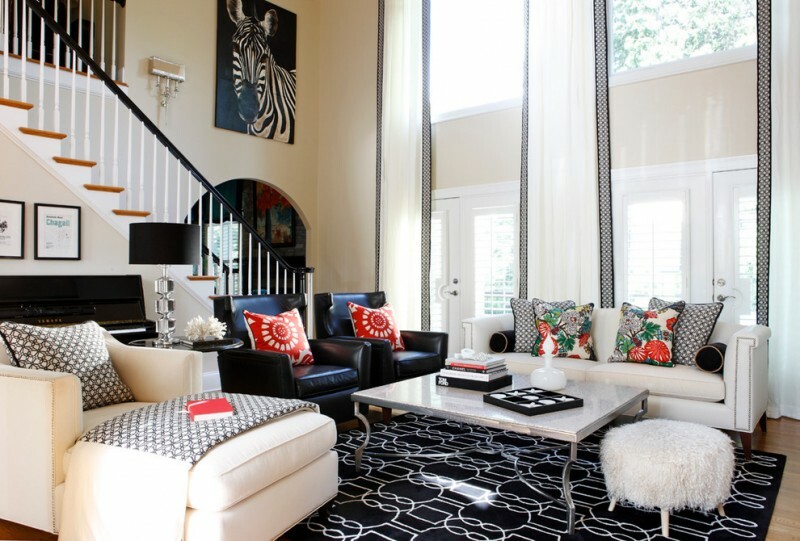 Mini white sectional looks so cozy with some tribal-covered throw pillows. Small leather chairs is added to give an accent or focal point in room, and square-shaped glass top table is a real symbol of modernity. All these interior elements complete each other, providing the coziest spot to welcome and to entertain your guests. With dominant white, the chair looks so simple yet elegant. A lot of black polka dots borders add accent color, and black-finished oak legs act like a strong and durable base. Red-white stripes throw pillow here is a focal point that instantly gives a direct attractiveness in this room. Make a difference with such ethnic living room set. This idea mostly adopts Ottoman style which is obviously found in area rug and furnishing pieces. White is used to create a beautiful contrast to black-finished furniture’s structure. The coffee table, in addition, is clean line and glossy surface, still exposing Ottoman style without ignoring the modernity aspect. 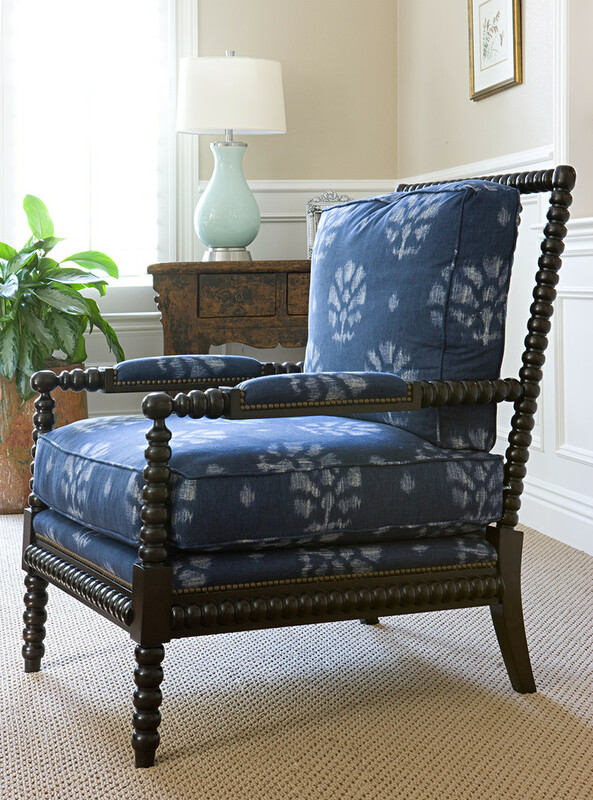 Blue spindle chair with white motifs, a good choice for furnishing an ethnic or eclectic living room. The chair gives an antique and old look, matching for you who love something shabby but stylish. 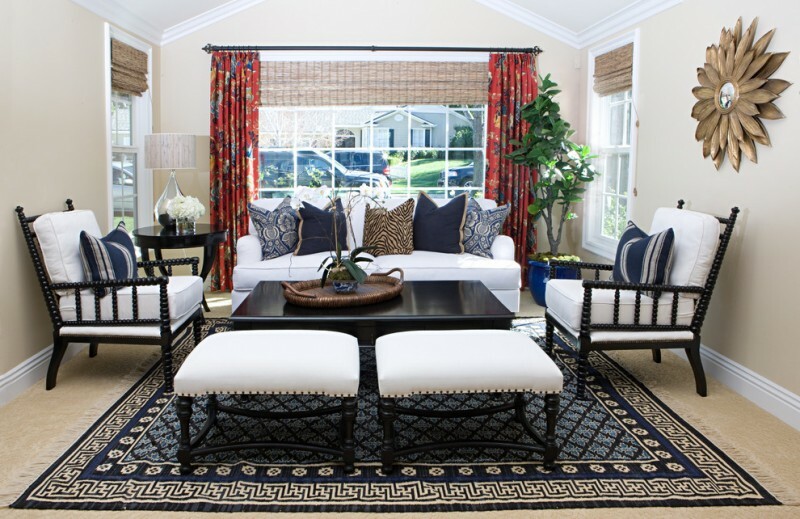 An inviting and warming living room with white sofa, black accent throw pillows, and light blue shag carpet. It’s good idea to collaborate this seat with a modern minimalist coffee table like this rectangular glass top table. The light fixture adds glamour look with its black shade and glowing gold tone ambiance. An adorable sectional with the best dark leather finishing, adjustable back-rest, and additional facing cushion. The design and color are obviously modern. Just add something bright like white accessories, silver vase, and fresh fruit display to make this room playful. 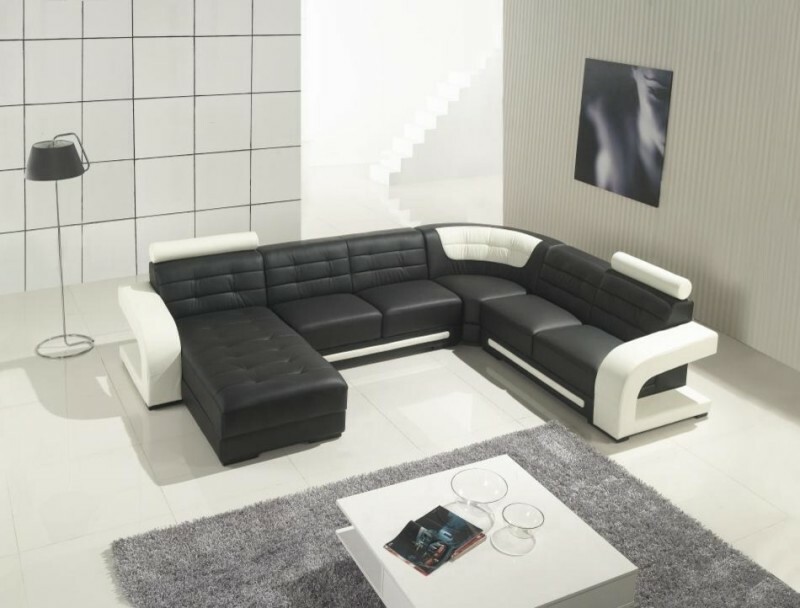 U-shape modern black sectional with white accents shows an ultra modern look. Its leather upholstery provides extra comfort, and some additional features like armrest, backrest, and padding on seat give much more comfort. White trims and armrests also add the interest. Complete it with high end white coffee table and grey shag carpet that convincingly improve the furniture performance. Simple but inviting – a white tufted sofa with a small throw pillow. Modern glass table with black trims becomes a marvelous match. Cowhide rug also adds aesthetic value as well as a contrasting tone for both the seat and table. This is a scandinavian style living room that exposes a modern-traditional mixture. Here, we discover a block butcher coffee table that’s commonly used for a traditional interior home. With a modern dark sectional and chair, both table and seats balance each other, creating a perfect combination of style.